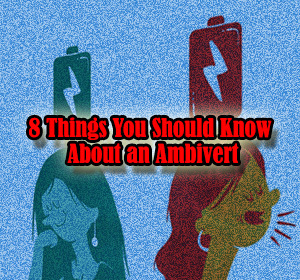 8 Things You Should Know About an Ambivert - Ambivert an introvert-extrovert hybrid. Based on several studies as much as two-thirds of us fit into this category. According to the psychologist, extroverts happy to be among many people and is often the center of attention. They often get bored or anxious when alone. On the other hand, introverts prefer being alone, or only with a friend or a small group of people. They feel tired when you're in a crowd. But the ambivert pick the traits extroverts and introverts. Adam Grant, an organizational psychologist and professor of psychology at the University of Pennsylvania's Wharton School, explains ambivert probably better than introverts and extroverts in understanding the emotions of others. Capabilities that make the personality ambivert being a parent and a better partner. First. Ambivert share characteristics with introverts and extroverts. If you are a ambivert, you have the ability to socialize (as extrovert). However, it can control themselves in solitude. Second. Be ambivert means having a flexible personality. They can go back and forth between introvert and extrovert or neutral is in the middle. Ambivert easily adapt to new situations. Third. Sometimes, ambivert not confident with their personality. Therefore, they sometimes can feel trapped, not knowing how to act, or when it's time to regroup and try something different. Fourth. Being a great trader. A study at the Wharton School found people who have a personality in the middle of introvert and extrovert able to do the best sales and bring the most money. The reason they are quite enthusiastic about engaging with people without appearing overbearing feeling. Fivth. Feel comfortable everywhere are signs of ambivert. We all have different thresholds. For example, introverts more pleased with the silence, very little noise and activity, so they prefer to be alone or in peace, in a quiet area. Extroverts crave more stimulation in their lives. Sixth. Intuition is part of a ambivert. Unlike extroverts are sometimes difficult to know when to stop talking, and introverts who may choose not to speak, ambivert instinctively know when to listen and when to keep quiet. Seventh. ambivert is "emotional bilingual" or be able to read the emotions of people. Therefore ambivert have a variety of skills and to connect with a wider reach. Eighth. Ambiverts unique act on social media. According to a study from Arcadia University, extrovert more posts on social media and tend to be associated with people they do not know, whereas introverts most of her friends are just friends and family. While ambivert not like the personality type and just do things according themselves, they are smart in giving and receiving.